Eugéne Boudin (1824 -98) was one of the most important precursors of Impressionism. It was he who encouraged the young Monet to abandon the studio and paint outdoors, believing that 'everything painted directly and on the spot has a strength, a vigour, a vivacity of touch that can never be attained in the studio'. It was in the early 1860s that Boudin first began to paint the elegant summer visitors on the beach at Trouville. These delicate paintings brought him financial success and are what he is famour for today. 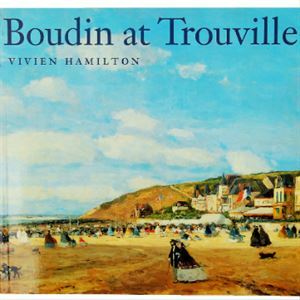 Boudin at Trouville by Vivien Hamilton reveals the many other aspects of the small town that attracted Boudin.